GE made a raft of these things and there's barely a dime's worth a difference between them. There's a DW-40, DW-47, DW-48, this DW-49, DW-58 and DW-68 models. There may be more. 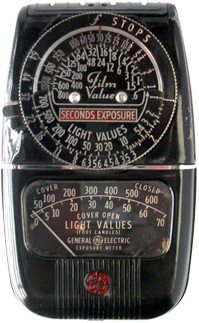 Except for the 40 and 47, they're nearly identical outside of tweaks to the dial and the meter face. This one, for instance, has two scales on the face: you read the upper scale with the cover closed and the lower scale with the cover open. No comment about what to do with the hood off. Compare this against the DW-58, which has different pointers on the calculator dial to use depending on the option you've chosen. The DW-48 is obviously part of the family but was made from Bakelite and has art deco styling. The DW-40 was a 48 without the hood. This is an earlier variant than my DW-58, because it has the older calculator hood. GE, like Weston, had their own film speed ratings before ASA became the standard. GE numbers (like Weston) follow the same geometric progression, but of course the base values are different. 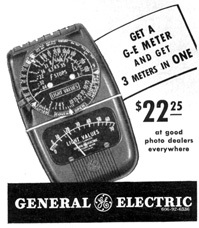 When ASA took over, GE sold replacement hoods with calculator dials calibrated for ASA (they say Expos. Index on them), but the ones that use GE numbers say "film values" somewhere on it. At least this one does. The DW-58, 68, the PR series and the Mascots came out after ASA became the industry standard. To convert ASA into GE, multiply the ASA index by 1.2 and you get the approximate GE equivalent.